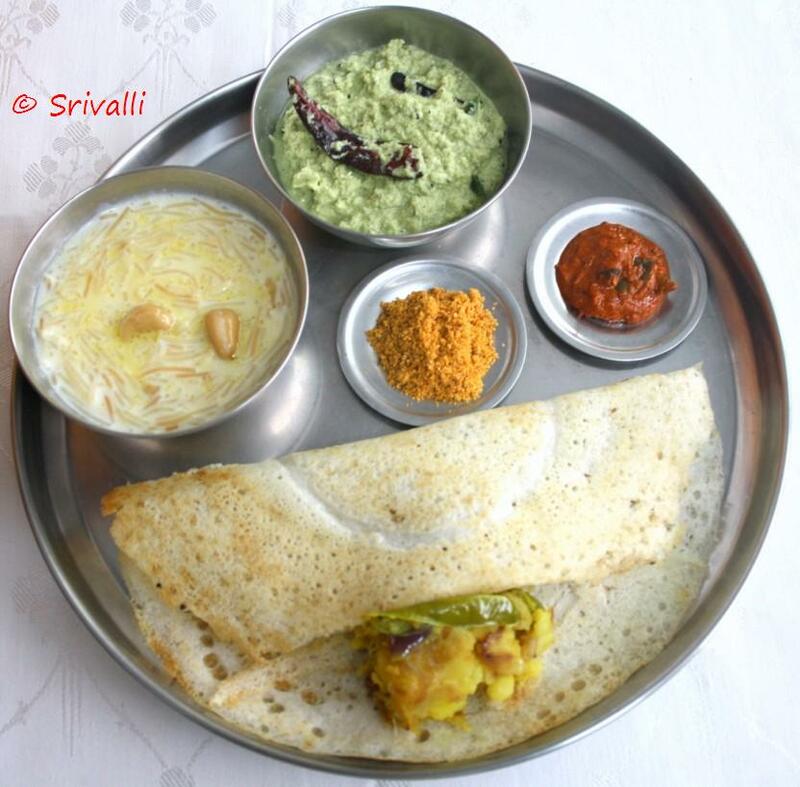 Tuesday’s breakfast menu was Masala Dosa, Coriander Coconut Chutney, Amma’s podi, Chinna vengai pachadi (Shallot Onions Chutney) and Seviyan. I have already posted how we make Masala Dosa and Amma’s Podi. Will be posting the other recipes soon. The day was special to us as it was Konda’s birthday. She celebrated her 9th birthday. The birthday girl was busy walking the ramp with the different dresses that she got from her Aunts and from us. She was also planning to dance to the tunes along with her cousins as it was couple of years back. Since the kids wanted Pizza, I didn’t plan for a special dinner. Special for the kids is anyways is the regular Paneer Butter Masala with Parottas, which I already made on Saturday. so decided that it was going to be just pizzas ordered in. Though I thought of taking a picture of the Paneer Pizza that we ordered, before I could even think about it, it disappeared! Starting with the breakfast, I made the famous Masala Dosa of Tamil Nadu, where Potato masala is stuffed inside the dosa and served with a variety of Chutneys and Sambar. Potato Masala that I made was thick for it to be stuffed in. For a change I made Coriander Coconut Chutney, Onion Chutney along with Amma’s podi. Our regular stock of Amma’s podi got exhausted and I got a fresh batch made by Amma. Keeping with our custom of making a sweet on birthdays, I was wondering what to make that will be enough to feed 12 people with couple of servings. Seviyan or Semiya Payasam came to mind. This is my favorite sweet when Amma makes. I don’t make it so frequently and confirmed that my guests like this. As you got to use more milk to get that richness, I was contemplating on quantity of milk, I remembered the tin of condensed milk lying around. I had plans of making Eggless Chocolate Cake with it. But since my oven is not in a working condition, it will be a while for me to attempt it. I decided that the best way to use up the tin is to make the Seviyan. In a pan, roast the nuts and raisins in ghee. Remove and in the same ghee add the vermicelli. Roast till they turn colour a bit. In another pan, boil the milk. 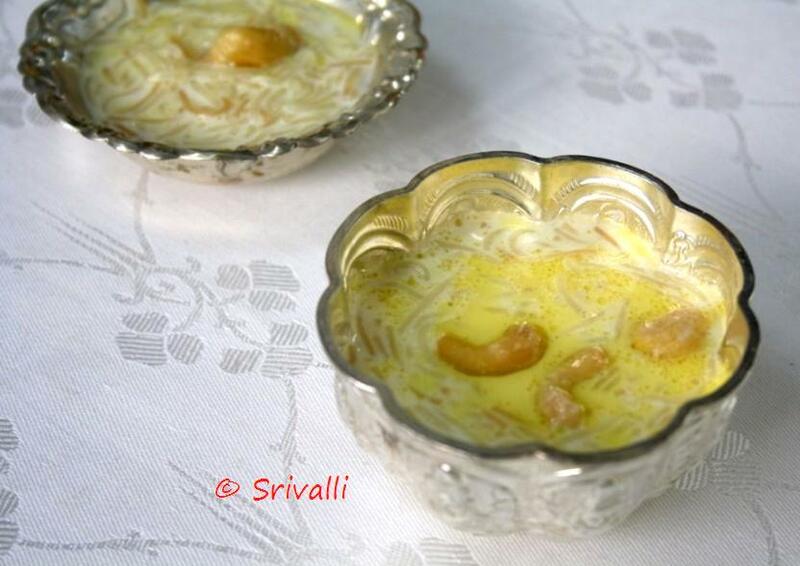 When the milk boils over and simmered for 10 minutes, add the roasted vermicelli and water. Cook in low flame till the seviyan is cooked. Ensure you don’t over cook the seviyan. At this stage add the sugar and cardamom powder. Continue cooking over low flame, when you check the semiya is cooked well. slowly add the condensed milk into the pan, stir well. Finally add the roasted nuts and raisins. Notes: Normally to give more richness to the Payasa, we may just add small quantity of condensed milk. But this is completely made with it. Hence it is extremely rich and very filling. You may dilute the proportion to suit your taste. Another important thing to note is to ensure you don’t over cook the vermicelli, since it has the tendency to absorb more milk and the porridge becomes very thick. Reduce the quantity used for making for lesser number, this yielded me enough to serve app 10 – 12 people. I hope you enjoyed my series on traditional South Indian Breakfasts. My relatives have left today, hopefully they enjoyed their stay. Do suggest if you want any more such series here. I wish I were your relative :D…the presentation is very beautiful and inviting. Happy Birthday! to Konda. This South Indian breakfast series is really great. Love each one of them. Semiya payasom is my favourite payasom after the paripuu payasom. Looks yumm. Beautiful!! Best wishes for the birthday!! payasam look awesome! I need a tiny favour. This might seem weird, but i have no where to go and I ask this knowing u know a lot abt andra cooking. I tasted this dish 12 years back in an andra home made up of plaintain flower (which we call vazhai poo). It was semi thick gravy, deep yellow colour and super spicy with loads of flavours. Do you have any idea of a dish like that?If so, do let me know. I do not have any friends who are from andra who can help,; I relentlessly googled…no help! so, I had to come to you. Belated B'day wishes to Konda! And of course, Happy B'day to Konda! Nine years old! A big girl! Many happy returns to Konda – and that was a lovely birthday feast you made for her. 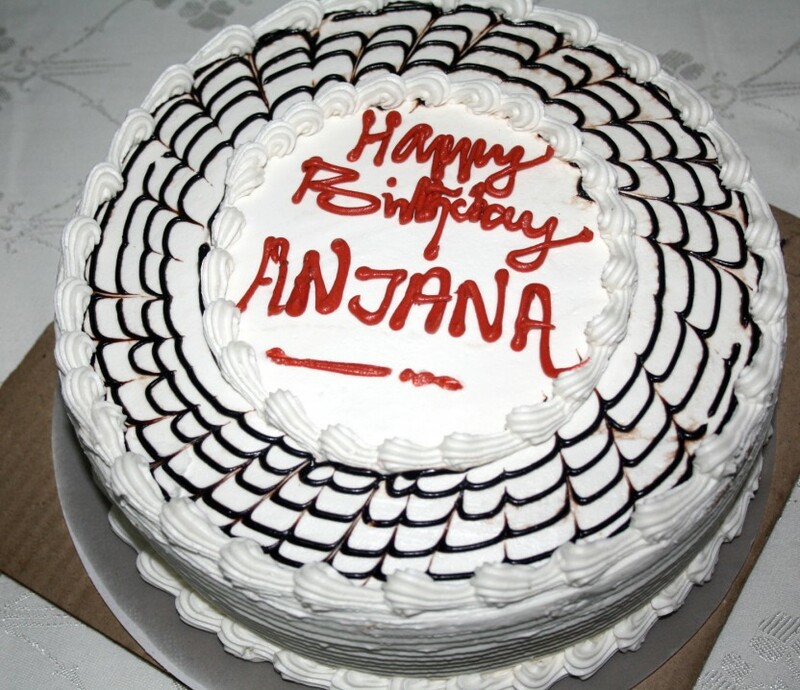 Belated bday wished to dear Konda! thali looks so inviting..first time here…bday wishes to Konda…god bless her.. This looks really yumm Valli , i think i will try this one. Trying it before i make for Onam , so i can give it for my inlaws when i give them a onam dinner .